This campaign takes place in a small dwarven settlement, long abandoned. Many years ago a battle was fought, and the spirits of the original combatants are still fighting. The Warriors must somehow survive a war that is taking place on levels they can barely perceive. “Cursed be we that came to this backwater!” The grumbler was the wizard Mortimer Leven, and he was addressing the comment chiefly in the direction of the band’s leader, the ever-jaunty Gunther Sumershaeme, the disinherited noble who ‘always bounced back’. The man ignored him, studying the out-of-date map of the area a cunning halfling had sold him, and trying to figure out which mountain was which. “Do not curse thyself, my wizard comrade. Instead be bold, and face the rain and wind. Are we not Warriors? Can we not endure hardship?” That came from Rellot Pineward, the Warrior Priest, who was somehow managing to listen to the grumbling wizard, while reading his holy book. A long-suffering sigh was his only response, echoed by the fourth member of the group, the Questing Knight Gart of Gisoreux, who was morosely studying his armour, which stood a good chance of rusting over if the rain didn’t abate soon. A silence fell over the group, only broken by the lone piping of some far off bird, and the noise of the wizard scratching his week-old beard. “Got it!” The Noble rolled up the map, snatched up his rapier from where it had been spiked in the ground, and set off walking towards an outcrop of rock some miles off. The others began to follow him, the wizard struggling to return his various items into the correct pouches as he walked. The Warrior Priest called after their leader. “For me” said the Knight “I’ll be just happy to get in the warmth and dryness.” His Bretonnian accent could sometimes obscure his meaning, but he had improved since meeting Sumershaeme. The sparsely occupied lands in the foothills of the World’s Edge Mountains are the destination of the Warriors, and they have managed to find somewhere to spend the night. Dwarven traders occupied a system of caves built into this rocky outcrop many years ago. These traders set up a supply base, building storerooms and rooms, but before long were forced to retreat before a goblin army. The small post was left empty until a necromancer, fleeing righteous persecution, came upon it and settled in. In time he hosted two fellow necromancers, who used their undead servants to furnish the place with things plundered from the poor villages nearby. After several years Witch Hunters tracked them down, and a small force attacked and killed the necromancers. Another trio of wizards led this force, neutralising many of the necromancer’s tricks and spells. However, at the last moment the necromancers used the corpse of an ancient, mighty warrior to attack the wizards. It killed two of them before finally being burnt to a crisp, and the last wizard only just managed to contain the sorceries of the enemy, nearly killing himself in the process. In the end though, the necromancers were killed. The Witch Hunter captain who had led the soldiers and had killed two of the necromancers himself saw the pain of the last wizard, and agreed to leave him behind to recover. He assumed that he wouldn’t live long, and left him to a peaceful death, rather than force him on a journey that would almost certainly be fatal, in his weakened condition. As it happened, the wizard did in fact survive, and recover. However, he sensed the dark forces still present, including the weakened spirits of all three necromancers. Rather than return to the empire, the wizard remained where he was, dedicating his life to restraining the evil forces. By the time the warriors arrive, the wizard is long dead. However, his spirit fought on after death, holding back the three necromancers from returning to power. This situation lasted many years, until a young man fleeing righteous persecution came upon the site. He too was a student of necromancy, and he swiftly managed to turn the situation to his advantage. Using one of the many arcane devices the wizard had used in life, he trapped the soul of the wizard, and lent some of his power to the three spirits. Over the next few years he learnt of the secrets of necromancy, and he managed to return the three spirits to a form of material existence. All three could create a weak shadow of their earthly bodies, and could inhabit it for short periods. However, they could also inhabit the body of the young necromancer, pushing his spirit out for a time as they used the body to rebuild their home, recalling bodies from the dust and trying to erase the last remnants of the wizard’s spirit, which still fought tenaciously to escape. The rules of this adventure are based on several house rules, which are minor tweaks to the game dynamics. One of these is the Unexpected Events dice, which is rolled in the Power Phase as normal. It is separate from the Power Dice. As normal, an Unexpected Event occurs on a roll of 1. Don’t roll for Unexpected Events if the warriors are already in a battle. However, the rules for Unexpected Events are different for each deep, as detailed where appropriate. The First Deep is the cave system in the spur of rock. Here many types of monster have gathered over the years, and the necromancers find them a useful deterrent. Events that are Monsters (‘M’ Events) come from the normal Monster Table. However, if the Event is an ‘E’ Event use the Event Table from the Roleplay Book. Reroll any form of Encounter, except for 15 and 16. The area is remote and unknown to adventurers, so it is unlikely that there will be any humans. 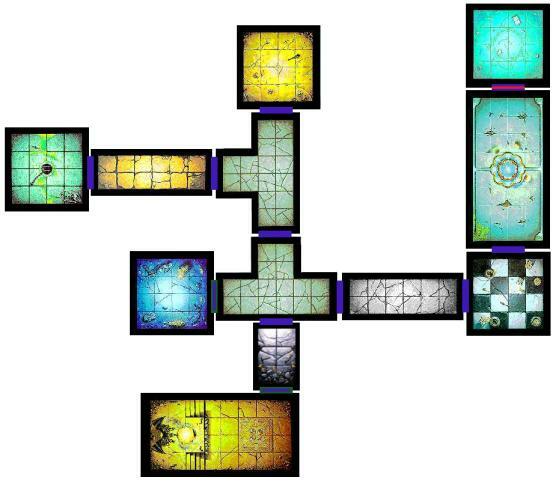 There are 5 dungeon rooms in the First Deep. All are treated as normal, with each generating an event. The warriors receive one item of Treasure for each ‘M’ Event they successfully complete. There is a secret door from the 8th board section (the corner) that leads to a further room and then the Objective Room. Apply any modifiers necessary for the warriors to find the door. It will have been used regularly, so there will be signs, like footprints in the dust. Perhaps one of the monsters even tries to open it! If necessary, use something obvious, like a map. You push back the great doors; hands ready to grasp weapons. The chamber is long and thin, with a ladder at the end, leading up to a second level, shrouded in darkness. With a shriek, a band of ghouls jump down, and attack! The Priest struck with a mighty overhead blow, smashing the ghoul into oblivion. The warriors looked around at the chamber, studying the second level and the trapdoor in the floor. Suddenly, the Priest felt a cold presence enter the room. He found his eyes drawn to the pattern of light playing over a still figure, standing on the second level. With a rush of thought he recognised the phenomenon. The wizard at his side looked questioningly at him. There are 1D6+4 ghouls, who have Ambush, Magic A. The ladder is at the end of the room, where the rope dangles on the board piece. It takes two moves to climb, and a warrior must begin his turn adjacent to it. He cannot climb if pinned. In practice, it takes a warrior his whole turn to move onto and up the ladder, then off it onto an upper square. He may then use his attacks as normal. Attacking while on different levels imposes a –1 to hit penalty for the lower fighter, and a +1 to hit for the higher fighter. Once the ghouls are dead (no treasure) read on. As you glance around, pulling weapons free from the corpses, the shadows on the second level seem to part, as the outline of a figure appears. The figure is surrounded by pulsing and moving lights, which obscure any features. After a moment the lights fade away, and their light is replaced, as the dull torches set around the room burst into flame. Standing on the second level is a pale, thin man, no longer surrounded by the nimbus of light. He gestures, chanting, and piles of bone fall together, forming skeletons. The warriors pick up their weapons to fight again. The Warriors must fight 1D6 Zombies, who appear on the lower level, 1D6+3 Skeleton archers, who are placed around the upper level on the ledges, Necromancer Malez (weak) and 1D3 Zombie ‘Bogyguards’ next to him. See the appendix for details of Malez and Bogyguards. When Malez is defeated he will cry “So! A challenge for my brothers!” as he disappears. There is an item of Objective Room Treasure, as well as a pile of gold. Roll 1D6 for each warrior and multiply it by 50, dividing the total up between the warriors fairly. The warriors can move on from this level by examining the trapdoor. Beneath it is a ladder that leads down to the delvings, the area that the dwarfs originally hollowed out. The ladder goes several meters down, where the tunnel widens into a room. Directly below the ladder the shaft continues, but the ladder appears to have been broken off, as it stops at this level. The shaft has slick walls that glisten with slime, and descends past the lantern’s field of light. This level is the first that the necromancers inhabit. Therefore, all monsters will come from the Undead Monster Tables. Any monsters generated in this way have an item of Treasure, but those found in the rooms do not. The rules about the ‘E’ events are carried on from the previous Deep. To represent the monsters rushing about on errands, the Warriors must roll two Unexpected Events dice. If both come up 1, it only generates one event, however! As usual, don’t roll if the warriors are already in a battle. The first room (the Well Chamber) is empty of monsters. The 5th board section is a crossroads that has three obvious exits, and one hidden exit. The hidden exit leads to a room with 2D6 Zombies and 2D6 Skeletons. It can be found on a simple initiative test. If the Warriors are on the board when they generate an Unexpected Event, which is monsters, they will come out of that room, and will reveal the door. Ahead of the warriors is the ‘Dead End’ passage from WD 192. If you don’t have this, use a normal corridor with the Cave In marker halfway down. The board is filled with Skeletons. Several Skeletons are busy here; wielding spades, picks and shovels. It seems that they are burying something in the ruins of the tunnel. One by one they turn to face the warriors, lifting their tools to use as weapons. The Knight groaned as his back protested at the peasant-work he was engaged in. The Noble hardly seemed to hear. He was using one of the spades to clear away the loose earth, hoping for another gemstone. He hefted the tool with surprising skill and brought it down, cutting through the rocks. He tried to pull it back, but it was stuck fast. One by one the others pulled on the protruding handle, finally pulling all together. The pick came out, pulling a large lump of stone with it, and the warriors sprawled on the floor. Seconds later the tunnel face collapsed, exposing an already excavated area. The Wizard was the first up, scanning the newly discovered area, then bending over for a second to pick up a large gemstone. The warriors should continue to roll for Unexpected Events while on this board section, even while fighting. On the first occurrence, the monsters in the hidden room will come to join the battle. Once the battle is over, the warriors can try and see what the skeletons were trying to do. If they dig away at the earth, they find a gemstone worth 50 gold. With any luck they will dig on! To dig, the warriors must roll their Damage Dice + Strength, exactly as if they were wounding an opponent. They can continue to do this until they have amassed 30 ‘wounds’, at which point they break through into a new area. They find bits and pieces worth 1D3x20 gold. The new area is the Idol Chamber. The room beyond is totally black except for the dim light of a greenish fire at the far end. A great statue of some unholy monstrosity stands over a bowl, in which the flames burn. In the bowl there seems to be some solid objects. Scattered around the chamber are crumpled, withered bodies of humans, and even some monsters. Many appear to have had their hearts ripped out. The necromancers have put all of the holy objects belonging to the wizard in this room. They have cast foul spells and invoked dark forces. They intended to collapse the tunnel, but it was hard work (good dwarf stone) so they commanded their slaves to simply fill it in. As soon as a warrior tries to remove a weapon, cast an immediate necromantic spell. He will find, also, that the weapon is stuck fast in the fire. As soon as they decide to overturn the statue, they will be attacked. As you strike the first blow, smashing into the stone, spirits coalesce behind and around you. With them is another group of lights around a figure, just as before. The lights disappear, leaving another frail-looking man- but not the same man as before. He must be another of the great necromancers. As he retreats, he is replaced by the Dæmon Kathrun, who will fight to defend his statue. He too appears in the appendix. Once all of the monsters are slain, the warriors can continue the job of toppling the statue. It has Toughness of 3 and 15 wounds. Once destroyed, the flames in the bowl die down, and the warriors can withdraw items. The first item is automatically the Soulstone, placed at the centre of the flames. After that, warriors may withdraw one item per turn by rolling on the table below. Each item can only be withdrawn once, so reroll the dice if you roll the same item again. When the Warriors withdraw the Soulstone, read the following. You withdraw a glass sphere from the centre of the bowl. It is not clear, but is clouded in the middle. It is warm to the touch. The Wizard (or equivalent) identifies it as a Soulstone, which can be used to capture and retain a wandering spirit. As he lifts it, it begins to glow brightly, and the cloud in the centre flows out, to take the form of a man, dressed in the robes of a powerful wizard, who begins to speak. “Greetings, my friends and rescuers. I am Robert Raglin, and in life I was devoted to the suppression of the dark spirits of this place. Even in death I fought them- but with the help of a living ally they imprisoned me here. This room was built as a shrine to Sigmar, but the necromancers turned it into a place of evil, using it to hide holy weapons that they couldn’t use, or twist to their designs. Now you have freed me, I bequeath them all to you. The spirit fades away, and the warriors feel strengthened. The warriors have their Wounds, Luck, Power and Faith restored to starting levels. Once the warriors have reached the objective room, read the following. Having fought through the guards, you find yourself in the centre of the original dwarf settlement. Here is the well that brought life to the traders, now polluted and slimy. On the assumption that they’ve cleared out the rest of the level, the warriors may examine the room. If they have not been in the Idol Chamber yet, they really need to. At the far end of the room is a locked door that is sturdily braced with steel. It has Toughness of 5 and 2D6+2 wounds. Alternatively, the warriors could try and pick the lock, if they have the tools. Beyond it is the Circle of Power. The wizard chanted a few syllables as he tried to open the portal again. After a few moments the floor at the centre of the room seemed to become misty, and when the wizard waved his hand the mist cleared, showing a set of steps leading directly down. Summoning his courage, the Noble lifted his rapier and the lantern, and began to descend. He didn't trust the sorcerous stairs, but they were firm beneath his feet, and he pushed open the door at the bottom, and stepped through. Roll for a necromantic spell on each of the Warriors. Place overflowing monsters on the Fountain board section, if necessary. The warriors gain one piece of Objective Treasure for this battle, and 1D6x50 gold altogether from the treasure here. Once the warriors have fought through, they can try and examine the room. Roll for an initiative test, +3 for wizard characters, or +1 for educated characters. Any character that has no innate magical ability only succeeds on a natural 6. On a 6 or a score of 7+ the portal reopens. Place the Descending Stairs tile in the centre of the circle. The warriors may move into the Third Deep when ready. The cellars have been dug at some stage, probably by the necromancers. Because the warriors have dispatched most of the undead already, Unexpected Events only occur on one dice, as is usual. However, they will only ever be ‘M’ Events. The first room has no monsters. There is no treasure whatsoever except where specified. When the warriors reach the firechasm, read the following. Make a dice roll for anyone with an Initiative of 5 or above. On a roll of 6 they realise that the chamber is colder than the corridor. Once in the room, the warriors will move towards the gold. If any warrior doesn’t try to, tell them that they must make a Willpower test to stop (difficulty 7). If they fail, they keep moving. If they succeed, the trap is revealed to them (as below) but not to anyone else, unless they try to warn their allies. This room is really a cunning trap. Using subtle magic as well as innate greed, the warriors are made to believe that there is a river of magma, but a bridge over it. In fact, there is simply a chasm. As soon as one of the warriors moves onto a lava or bridge square, read the following. With a sudden cry, you feel yourself falling. All of the dreams of gold are gone in an instant, as you plummet like a stone in a well. The other warriors must immediately make initiative tests, –2 if they have Willpower of 3 or less. If anyone scores 7+ then place both Pit of Despair tiles on top of the eight firechasm squares. Once one of the warriors sees the trap, they must try and warn others. Roll 1D6 for each warrior who is entranced each turn. On a 4+ they too see the trap. If anyone falls down the pit, roll 1D6. The warrior loses all but 1D6 wounds (assuming he had that many in the first place). The warrior somehow loses only 1D6 wounds. If the warrior survives, the others must still get him out. The rope will do the trick. If there is a warrior who is entranced, another warrior can try to hold him back. Roll 1D6+Strength for both. The highest moves both models in the appropriate direction. If the entranced model goes over the edge, he takes the other with him! 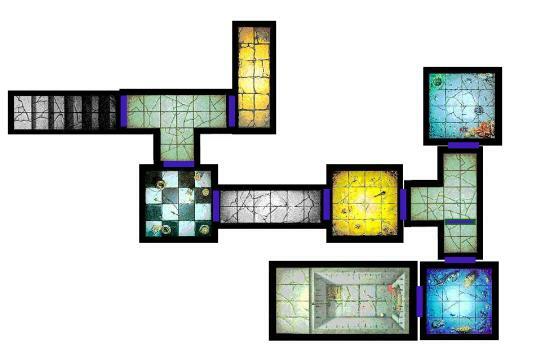 The Objective Room is the Tomb Chamber. To get to it, however, the warriors must cross a bridge. If you have the Pits and Traps Bridge, use that, with 2D6 Skeleton Archers and 1D6+2 Carrion. Otherwise, when the warriors open the door, tell them that they see a great chasm. They have to go to room 13 and operate the controls there (Initiative Roll of 8+ for Wizard, 10+ for anyone else) to call down the bridge. Place the Bridge from the Catacombs of Terror, or a normal corridor. 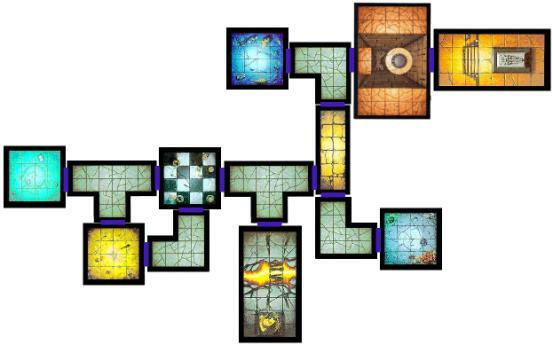 On the lower level of the Tomb Chamber are 1D6 Zombies, 1D6 Skeletons and 1D6 Ghouls. Place them in that order. If there is not enough space on the floor and steps, discard the remaining models. Place all four necromancers in front of the tomb, on the upper level. Their characteristics and rules are featured in the appendix. They will move towards the warriors when there is room. When the first of the spirits is killed, read this. With a cry of fury, the other necromancers seem to pulse with power. Then the great tomb at the other end of the room shudders, and a terrible creation emerges. The necromancers have summoned a mummy to aid them. Alandony has managed to communicate with the spirits by allowing them to partially possess him, and he has refined the technique over the last year. Although they can now exist in their own created bodies, they may still choose to inhabit his. Roll 1D6 each turn at the beginning of the Monster Phase. On a roll of 6, one of the spirits (determine randomly) joins with Alandony. On a roll of 1, one of the spirits already joined leaves. Remove or replace the model as appropriate. The effect is recorded in the appendix. If Alandony is killed while harbouring a spirit, the spirit is also destroyed. When all of the battle is over, the warriors each gain a piece of objective room treasure. One of these treasures is the Vampire Slayer’s Blade. This sword is worth 1500 gold, and is detailed in the appendix. Peter Haresnape, 9th July 2003. Insubstantial- this is similar to the Ethereal quality, but to hit rolls made with non-magical weapons automatically fail unless it scored a 6 to hit. Attacks with magical weapons are made as normal. Retreat- each spirit has an awareness of its own vulnerabilities, and knows exactly when to give up the ghost, if you’ll pardon the pun. When its wounds reach 0, it will flee, often shouting a catchphrase. Spirit Vessel- Alandony may be possessed by one or more of the three necromancers. This has the effect of increasing his characteristics by the amount shown in brackets in the spirit’s table. In addition, he receives +1 to his spell roll for each spirit in residence. Vulnerable Holy Weapons- Alandony receives Double Damage from Holy Weapons, and can only regenerate 1D6 Wounds in a turn he has taken damage from one. Holy Weapons are those that have been blessed, for example the Warrior Priest’s Hammer or the Sanctified Sword. Usually this also counts as a Magical Weapon, like the Magic Blessing on the Bretonnian Knight’s Broadsword. Hate Holy- This monster hates all those who carry holy weapons. The main treasure is the Vampire Slayer’s Blade. This is an Objective Treasure worth 1500 gold. Of the original four the Barbarian, Elf and Wizard can use it. This weapon does +1D6 wounds to Vampires and Necromancers. The wielder is immune to fear and terror caused by these foes. In addition, roll 1D6+Willpower whenever a Vampire casts a spell or uses a Vampire ability. On a 9+ it has no effect as your will uses the sword’s magic to negate the dark sorcery. Jewel of Light, worth 100 gold. Any model can use this. It shines with a holy light and acts as a lantern. In addition, the warrior is at –1 to be hit by Undead or Chaotic foes. Lasts for one adventure. Staff of Interdiction, worth 300 gold, Wizard only. This may be used once per adventure. It stops any enemy model moving into or being placed in one of the squares around the wielder, even if it is a flying monster. It lasts for one turn. Sanctified Sword, worth 450 gold. Any non-evil model can use this. A Sanctified Sword has been designed to combat evil sorcery, specifically necromancy. It is Strength 5, and counts as magical. Against Undead Attacks, the warrior receives +1 Toughness. There is one map for each Deep. Generally speaking they don’t use two board sections twice, but in Deep Three it may be necessary to reuse some pieces. In addition to these pieces, the adventure uses one piece from a White Dwarf and one from Pits and Traps. However, alternatives are presented. I have not written a room-by-room account, as most simply involve battles or events resolved as normal. Where this is not the case, it is indicated. There are three types of door. The first is a simple door, with no restrictions. The second is a hidden door, having a green band around it. Usually an initiative test is required to find such a door. The third is a locked door, with a red stripe. The warriors can try and get through using lock picks or the Open spell, or may try to smash through. I have not playtested this adventure, or any of the creations within. I have the feeling that the necromancers, in particular, may be either wildly too powerful or wildly overvalued, depending on the specific warriors. There are a few particularly nasty bits. The first is in the Fighting Pit at the end of the First Deep. When the skeletons appear around the edge, they can do a lot of damage while the warriors try to deal with the Zombies and Bogyguards, get up on the ledge, deal with Maraz, and actually hit the skeletons. In the Second Deep the warriors have to contend with double the chance of an Unexpected Event, which could severely hamper them. Indeed, this may be too much. The toughest bit is probably when they are fighting the skeletons who are trying to fill in the tunnel, especially if they get sandwiched between the digging skeletons and the skeletons and zombies from the room. Also, directly afterwards they have to fight several ghosts and a necromancer spirit, followed by a tough Dæmon. In the Third Deep, the illusion in the ‘firechasm’ is particularly nasty, and I’d imagine that there is a good chance of at least one party member dying, and potentially more! GMs might like to make it a bit easier to break the spell. What is more, if you use the bridge from Pits and Traps it may be quite hard to secure a foothold in the Objective Room. As soon as one warrior has got in, the bridge is liable to swing away, leaving him high and dry, and with a bunch of zombies for company. I’d like to mention the ‘Bogyguards’. I intended to make up some Zombie Bodyguards, tougher Zombies that have been resurrected from professional soldiers, and which are stronger than the average reanimated peasant is. However, fate and my typing got in the way, and they turned out as ‘Bogyguards’, which I thought was good enough. What am I going to do next? Well, the main reason I’m writing these things without playtesting is that I’ve left college, and hence my gaming group, and have no-one to test them with! In the next few months I might read around the Chaos Dwarfs and see if I can come up with an adventure for them. Alternatively, I might not. I have got a few adventures lying around that could do with a rewrite, or finishing, so I might do that. I also have a large pile of homemade treasure cards that I may offer. Anyway, I’m always interested in what other people have to say, so long as it’s relevant, witty and not critical in any way… drop me a line at peter@glynan.idps.co.uk to let me know if you have tried out any of my rules, or adventures. I’m especially interested if you’ve playtested this one, or have any queries.